The Ngurrara native title claims cover a vast area in the southern desert region of the Kimberley. The largest of the Ngurrara claims was determined on November 7, 2009 and includes 77,814 sq km the Great Sandy Desert and a section of the Canning Stock Route. In 2012, another two claims covering small parcels of land in the desert region were also determined. The Yi-Martuwarra Ngurrara native title claim was registered with the National Native Title Tribunal on February 29, 2012. The claim covers 22,130 sq km and includes country to the west of Fitzroy Crossing, south towards Halls Creek and into the desert region of the Kimberley. The Ngurrara claim group is comprised of people from the Walmajarri, Wangkajunga, Mangala and Juwaliny language groups. The Yanunjarra Aboriginal Corporation RNTBC manages the native title rights and interests of the Ngurrara people. Spider Snell dancing on Ngurrara canvas. Ngurrara: The Great Sandy Desert Canvas – Aboriginal Art Directory. National Museum of Australia – Ngurrara -The Great Sandy Desert. Alec Forrest was one of the 60+ Ngurrara artists. My review: [Alec’s Story is an auto biography by Alec Forrest, told in Walmajarri and recorded in 2000 by Olive Knight for the KImberley Language Resource Centre at Fitzroy Crossing, WA, Australia. It was later translated to English by Olive Knight and produced as a book and published in 2003 with the Walmajarri audio tape. Told over 19 short chapters Alec’s life is condensed to an eloquently described life from being born in the desert, losing his father, shot for killing cattle, living the life of a nomad child, describing bush tucker, growing up on GoGo Station to his harsh experiences living and working on a vast number of Kimberley cattle stations and spending years in the Derby Leprosarium. I had the good fortune of working with Alec (Longfella) Forrest between 2003 and 2006. He painted his stories on canvas and they were eloquently described by him. He was a reluctant painter in that he was not prolific in quantity due to an inherent mistrust of kartiya (white people). He would paint new paintings as the older ones got sold. He was very thoughtful about his subject matter and each of his works is unique in that way, unlike a lot of indigenous artists who paint the same subject over and over again. I was trying to encourage Alec to make a painting for each of the chapters in his book “Alec’s Story”. He was keen on the idea but reluctant to get too far ahead of himself. “See how these go” he said. I was captured by his unique style and eloquent stories. “If this (Junjarti) isn’t sold by the time I leave, I will buy it”, I promised him. He was not popular enough for a mass of enquiries to suddenly erupt but his work was GOOD! 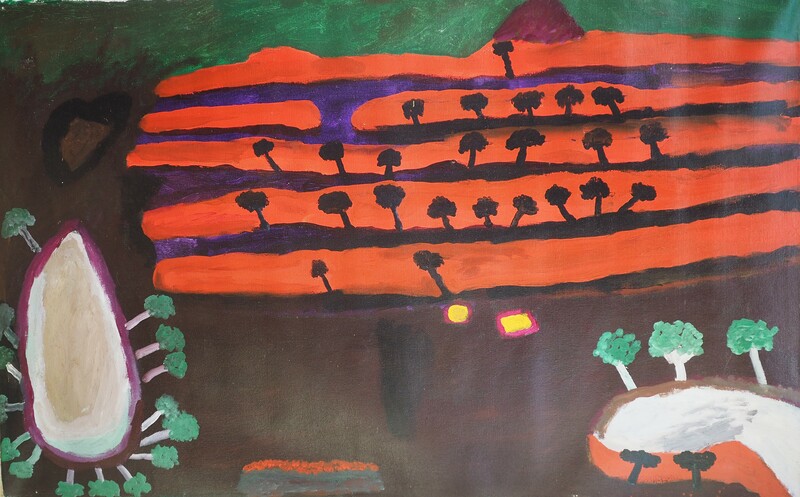 One of his later paintings, I consider this to be one of best and a more resolved version of the painting “Darnku Country” purchased by the Australian War Memorial in 2003 because of it’s reference to WWII.